With very attractive flowers, flared trumpets in colours from white to yellows, Hoop Petticoat daffodils are the common name given to Narcissus bulbocodium. They are a varied group with many easy care varieties to brighten the garden, or grow in a containerand the common name comes from the flowers which is said to look like a ‘hoop petticoat’. These are a group of species daffodils, and they include Narcissus bulbocodium conspicuus, obesus and romieuxii. Many named cultivars are also available, all with the distinct large trumpet. They may not be as big in flower as some of the hybrid relatives, but they are certainly a most attractive group of bulbs for the spring garden. Easy to grow and very pretty, Narcissus bulbocodium are worth a place in the garden. Hoop Petticoat Daffodils appear as grass like stalks in spring and then burst into bloom a little later. Delicate and very pretty flowers, however the bulbs themselves are quite tough and forgiving. These bulbs prefer full sun and a well drained humus rich soil, however they seem to cope with poorer soils as well. Given time they will naturalize into the garden, however they also do well in pots and containers. Plant at around 10cm deep, some species will drag themselves a little deeper over time. Over time they will multiply in the ground. 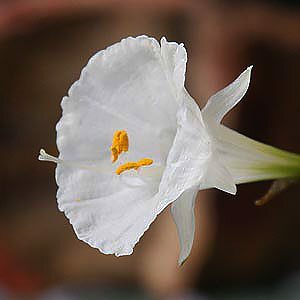 Fertilize Narcissus bulbocodium using well rotted compost or manure when dormant. Watering is not usually required except in very dry spells during the growing season. Narcissus bulbocodium (Hoop Petticoat) bulbs do not need to be lifted in winter unless they are planted in a very wet area (not desirable). Origins – France through to Portugal. Moisture – Well drained humus rich soil. Coastal Gardens – Only in prepared soils with protection from salt winds. Height – 10 to 20 cm depending on varoety. Narcissus Bulbocodium naturally occur through southern Europe, Spain through to Algeria. They are naturally a varied group. As they popular with collectors and enthusiasts many hybrids are available, if you know where to look. Narcissus bulbocodium conspicuus with its golden flowers is easy to grow and popular. Reaching around 15cm in height. 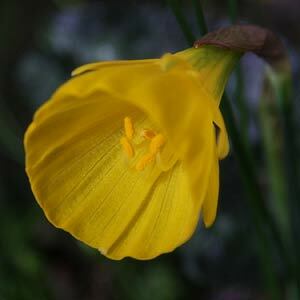 Narcissus romieuxii is an early flowering species with clear sulphur yellow flowers and a flattened open cup.